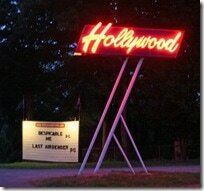 Contrary to my kids’ belief, I’m not old enough to remember the heyday of drive-in movie theaters. I don’t remember ever going to one as a child, but somehow I have a memory, perhaps from a past life or from episodes of Happy Days, an almost visceral knowledge of what they’re supposed to be like. Young couples smooching in the front seat of a convertible, families passing the jumbo bucket of popcorn in the old Rambler station wagon, music blaring from hundreds of equidistant posts, one hapless fella on a snack run desperately struggling to juggle one too many sodas, a dad rushing a toddler to the rest room. That’s pretty much what I found when we took the family to see Despicable Me at the Hollywood Drive-In Theatre. Ramblers have been replaced by minivans, and despite the vestigial sound posts marking the parking spots, the soundtrack now plays in stereo through your car radio. Otherwise, the drive-in theatre experience remains a fun family outing to the movies that won’t break the bank. Budget-minded families can watch two movies for the price of one, and the cost of admission for first run movies can’t be beat. It’s just $8 for adults, only $4 for ages 5-11, and children under five are free. Even the concession prices are reasonable. Where else can you get a large bucket of popcorn for only $5.50? On our outing, we took full advantage of the food concession. Arriving at 7PM, we had our pick of prime parking spots and plenty of time to enjoy dinner before the show. 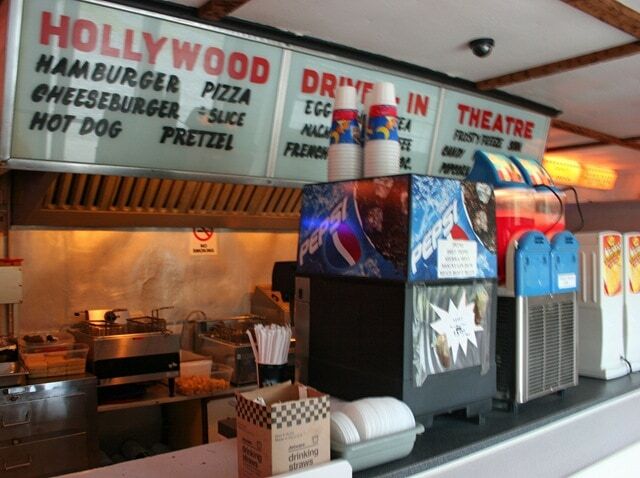 Meal options are the usual fast food items: hamburgers, hot dogs, pizza, nachos, etc. But, the food is fresh and tasty. The seasoned French Fries were a hit, and the chocolaty milk shakes were thick and rich. And, because we arrived early, we had loads of time to burn off the calories. 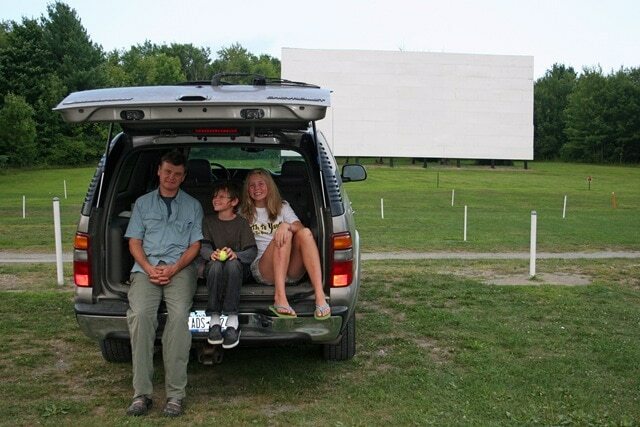 One of the advantages of taking kids to see movies at the drive-in is that they can run around on the grass field, and until dark, there is usually a pick up game of frisbee or soccer that anyone can join. Everyone is welcome at the drive-in, even your dog. 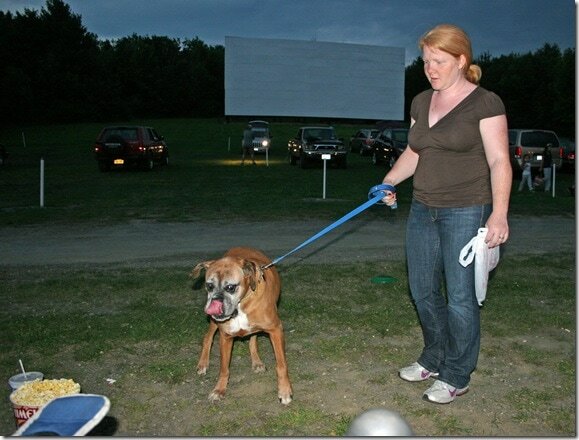 When we were there, this being Smallbany, we ran into old friends, and their sweet boxer, Ginger. By the time the movie started playing, I was a bit tuckered out. It was neat to see Despicable Me under the stars, in the comfort of my ergonomic Suburban front seat; but I nearly fell asleep and couldn’t manage the second feature, The Last Airbender. Savvy patrons came prepared with blankets and pajamas, but we just snuck out between films. Admission: $8.00 for Adult, $4.00 for Ages 5-11. For more information and movie listings, visit HollywoodDrivein.com. 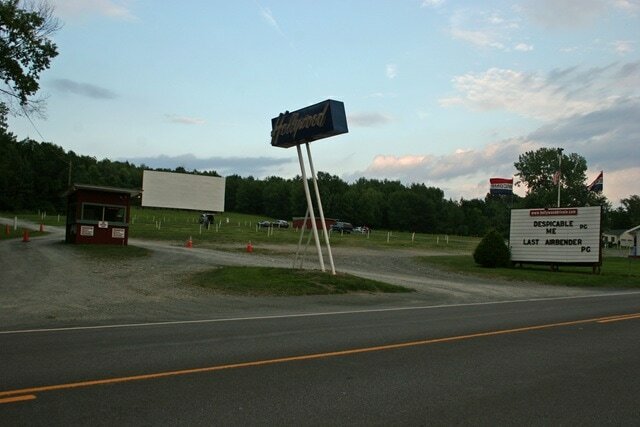 And for a complete listing of drive-in movie theatres in New York, visit DriveinMovie.com. Sounds like a great evening! We did the same thing a while back with some friends of ours, and the kids had a BLAST! I’ll admit I enjoyed it a lot more, too, because the only people I had to worry about my yacky kid bugging with his non-stop commentary were the folks we came with – and they’re used to his gabbing. And, as you said, you can’t beat the price. Ours, also a double feature the younger kids couldn’t quite last until the end of, was $16 for two adults and four kids. The guys can’t wait to go back again.